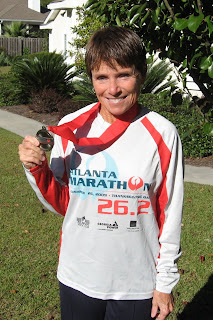 Mary Woodruff traveled to Atlanta to participate in the Thanksgiving Day Atlanta Marathon. Mary was disappointed with her 4:20 time, but hey - when your legs cramp and you don't have major hills to train on in Waycross, it's understandable! Atlanta is extremely hilly and they are not "little" hills! The weather was a balmy 40 degrees, great start for a marathon. Cramped legs or not, she still placed 2nd in her age group.